This was designed to be an easy week after my last training cycle and also knowing that this week I had to take a trip to Surabaya for a wedding. Despite being an easy week my training did not all go to plan. With my start up Qraved focused on dining it can some times becme a little too tempting to eat & drink too much! Anyway last week is past and a couple of memorable sessions including the MV02′s this week were good work outs. Also the 1.5 hr 15KM on Sunday night at 2% incline was a new treadmill PB for me. Focus now for my next 4 week cycle before a trip to HK at the end of October. 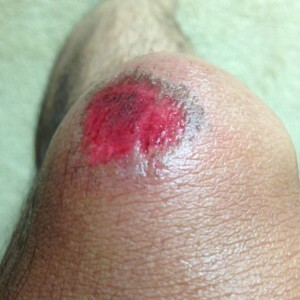 Highlight of this will be culminating at a 150KM bike ride. Overall this was a great training week which ended in a high with the 123KM bike which is the furthest I have ever ridden. I am now a complete convert to riding in BSD where the open flat roads make for safe and good training. I also did my second session of wet suit swim training in the pool. This is something I should do on a weekly basis to adapt to wet suit swimming. while the overall feeling is of more buoyancy my legs tend to tire more easily with the wet suit on. It is now officially 12 weeks till my Ironman and i’m feeling confident with my self coached training program at present. The with the unpredictability of running a start up Qraved – it is much easier to plan week by week and and the training each day than to strictly follow a complete 13 week plan. 4:00AM our alarms went off and after a surprisingly good night’s sleep I was feeling good for the race. As anticipated it was still raining but no surprises there. We made our way down to breakfast which started at 4:30. 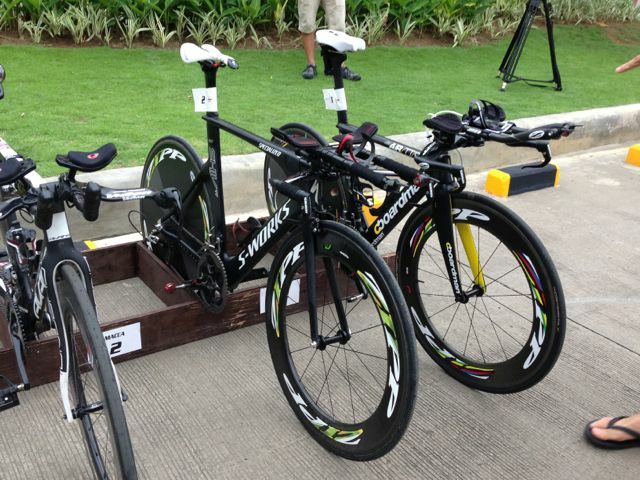 When we arrived the transition area was already buzzing with many of the participants checking their bikes. It had been raining all night so bike seats were soaked – perhaps a good lesson to learn here is to always bring some bin liners to cover the bikes in case of rain overnight! - Not drinking enough. I’ve realized that I typically need about 500mls/hour during the race. And considering you can’t drink during the swim that means over the bike leg i’m drinking almost 2 litres of liquid. Now, you have to be careful not to over hydrate so find out what works best for you during training but being properly hydrated is imperative. During IM 70.3 China I was severely dehydrated (lack of drinking during bike) and barely finished the run clocking in over 2 hours 45 mins. So what did I bring? For Cebu I brought 5 gels for the bike which I taped to the top tube for easy access. I decided to bring all my water bottles (3) which I placed on my torpedo mount and double tail mount. My thinking here was that I would go through my first bottle quickly to make up for the swim. I’d then dispose of that and have my remaining two bottles for the race and a spare cage for an additional bottle that I would pick up during the race. For the run I brought 4 additional gels and a pack of gel cubes – the course had plenty of water and Gatorade available so I did not bring a water bottle. Swim – Sea Swells, Jelly fish and kicking! The Cebu swim is beautiful. Perhaps one of the only races in South East Asia with clear visibility in the water. You literally are swimming with the fish! It was the first deep water start that I’d done so I decided to start in the middle of the pack. 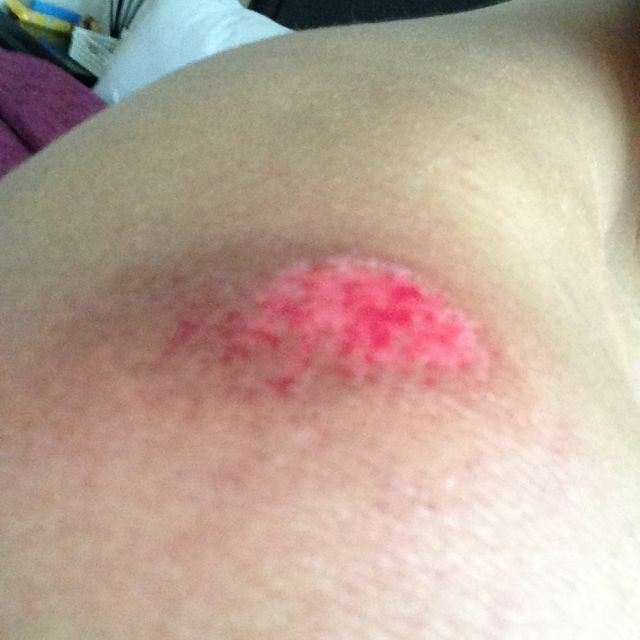 I’m an average swimmer with approximately 1:50-2:00 min./100m pace – this was a mistake. 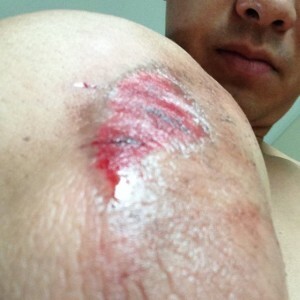 As the gun went off I was caught in quite a surge of legs and arms as athletes fought to secure a clear spot. The pack did not clear up for about 1KM and several times I had to stop to try and get to clearer water. The swim felt like it took an eternity sea swells hindered regular bilateral breathing and a couple stings on the neck by invisible jelly fish made it a less “enjoyable” swim leg. However 39 minutes later (definitely one of my slower swims) I emerged to head to T1. T1 was quite a long run I took 4 minutes in T1 and probably around 2 minutes of that was running to my bike. Coming to my bike I noticed Tevis leaving his bike station and it appeared that Casey had already come and gone. Knowing I had a stronger bike this time round I knew I had to use this to catch up! 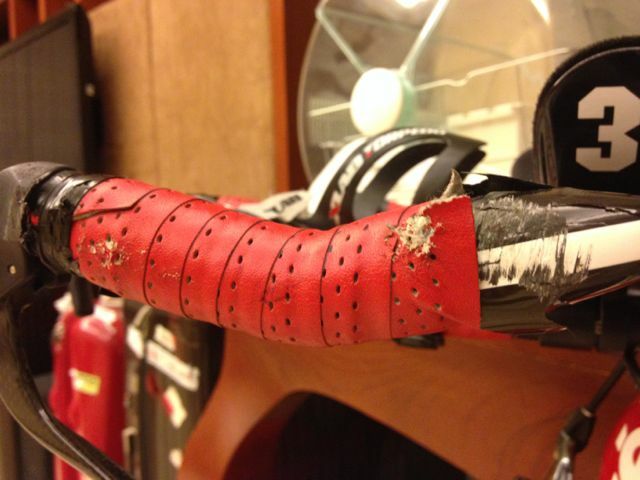 Bike – Cross winds, drafting and rain! The bike course takes you over the Cebu bridge onto a long highway which you double back on for 4 lengths before returning back to T2. For the most part the course is fairly narrow – this meant that in many instances it was impossible to not be illegally drafting as packs of 10-20 bikes were moving at constant speeds. Marshalls however were unforgiving and broke up backs by penalizing randomly people in the packs. Strong cross winds and occasional head winds also made parts of the course more difficult – especially for those with deep rimmed aero wheels and less experience in handling such winds. As my usual training ride in Jakarta often has cross winds I was fortunately adequately prepared for this. Upping my pace on the ride I decided to go above my planned speed to around 34KM/H to try and catch Casey and Tevis. However given the narrow roads I didn’t manage to make much ground until the highway – fortunately because of the turn arounds I knew that unless they had a big margin I would have the opportunity to see them. I saw them at the first turn around and this motivated me increase the pace further. Passing Casey at around KM 30 I moved ahead to catch Tevis. I soon reached Tevis and we rode together for about 3 Kilometers but as we neared the 2nd turn around I decided to use the outward bound leg and tail wind to make some ground. I accelerated to a avg. speed of around 35-36KM/H to overtake him. Tevis, with his “Macca Set” training, was a strong runner so I needed to get any advantage I could. The combination of focus on the bike in training and pushing to get more lead time on the run helped me proceed to a PB on my bike finishing in 2 hours 41 mins. Run – cool, amazing support, hitting a wall at KM 17! The run takes you right out of the hotel (vs. left which was the bike) towards the tip of the peninsula. The roads are lined with supporters the entire way with plenty of hydration and cooling stations. Coming out of the run I checked my watch and saw I was running a pace of 6:00/KM. Switching to my combined time on my Polar it looked like even with a 2 hour 10 minute run I could be on for a sub 5:30 – could this be true? This spurred me on but on every turn-around I was on the look-out for Tevis who had caught me with a devastating sprint finish at Bintan. At the large turn around on the peninsula I saw him – I figured he was probably about 800M behind – I thought I was safe. The run takes you on two loops and the race marshalls hand you a red arm band on the first and a black one for the second. Much of the run was without shade so we were VERY fortunate it was mostly overcast on the day. Things all seemed to be going well until I got to around KM 17. Suddenly my legs felt like lead and daggers stabbed my hips at each step. My pace slowed to around 6:30 but based on my watch I estimated that was still on for a sub 5:30. Then to my surprise Tevis sprinted by – he looked like he was doing around 4:30-5:00 on the last 4 kilometers! Crazy?! I didn’t try to follow and instead focused on trying to keep things together for a sub 5:30. Coming close to the finish – every spectator and marshall seemed to say it’s just round the corner but zig zagging around the hotel grounds to the finish line seemed to take forever. I finally crossed the line at 5:40 on the official race clock and 5:35 on my official time. Only then did i realize that the combined time on my watch did not include my transition times when i stopped my watch!! (doh!). Tevis finished 5 minutes ahead of me and Casey with a very respectable sub 6 so a great race for all of us. 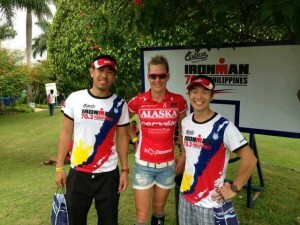 Overall Cebu was a fantastic race – my only regret was to not stay an extra day and enjoy the resort more. The combination of the professional preparation, the “star” value with pro’s and celebrities and amazing support throughout the race make it a go-to event for Ironman in South East Asia. Next year is bound to sell out even more quickly (Fred predicts 3 days!) and will open registration in October. 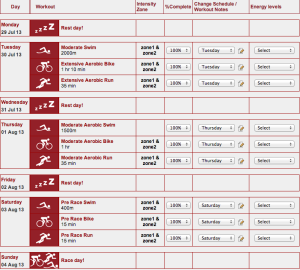 It’s already on my race calendar for next year but for now it’s all about Busselton at the end of the year. Feel free to contact me if you have any questions about the race – i’d love to share more! 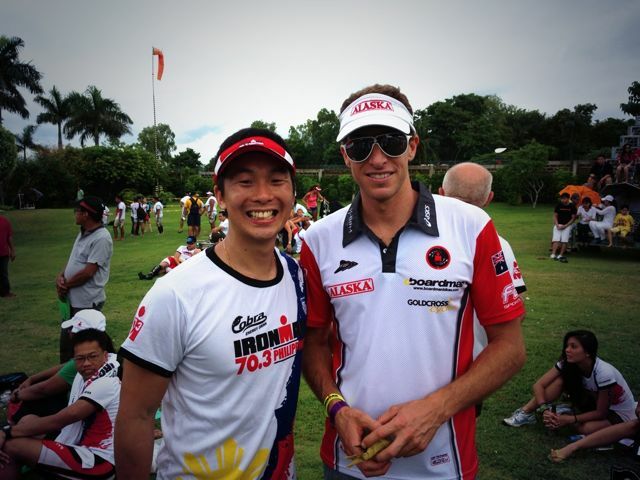 Summary: This post details my experience at Ironman 70.3 Cebu, Philippines, August 4th 2013. It is intended both as a diary of my experience and also to help provide triathletes an overview of this fantastic South East Asia race. 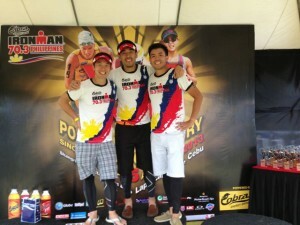 I decided to arrive at Cebu on Thursday – two and a half days before the race. While I was flying from Jakarta and only 1 hour time difference I felt that having an extra couple of days to deal with any technical issues and also allowing for plentiful time to review the course would be beneficial. We stayed at the Movenpick hotel which was not originally an officially sanctioned race hotel (despite being 5 minutes walk from Shangrila Mactan – the official race venue) but was upgraded as soon as the Shangrila was full. A word of advice here for future participants would be to book a room at this hotel early in advance as once it became an official hotel it was much more expensive. We booked a 2 bedroom suite for the 3 participants (Tevis Ong, Casey Au and Adrian Li) which was very good value. 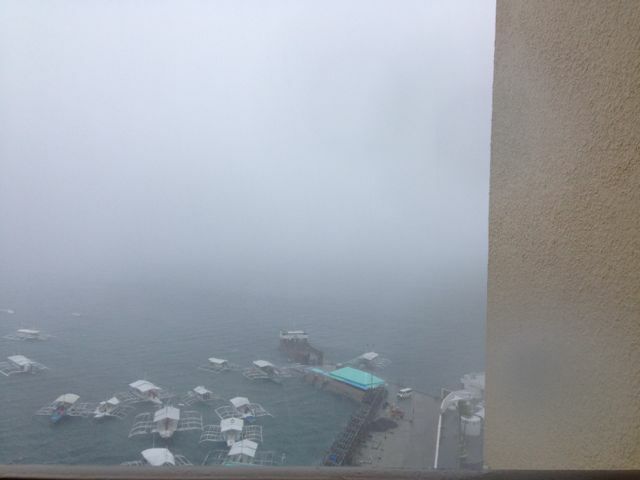 We had a sea view from which we could see the swim course for the triathlon. Arriving two days before turned out to be a good move. Tevis’s bike unfortunately had a damaged rear drop out from the plane and hence had to go on the hunt for a spare part. Also – the entire Ironman event at Cebu is like a show and the pasta party on Thursday night was complete with fire dancers, singers and celebrities. The fun did not stop there. On Saturday the race briefing featured Pete Jacobs giving us advice on how to deal with the heat (although that turned out to not be a problem at all!). During an introduction to the Pro’s Black Eyed Peas Ap.le.dee appeared as the “secret” competitor and sang for everyone and the National weather man provided the weather outlook. During the entire pre-race the event was very professionally organised and provided a very family friendly atmosphere for all the participants. Meeting Fred, CEO of Alaska Milk and Sunrise Events – what started as a hobby (triathlon) has now also turned into a full blown triathlon company – Well Done Fred! 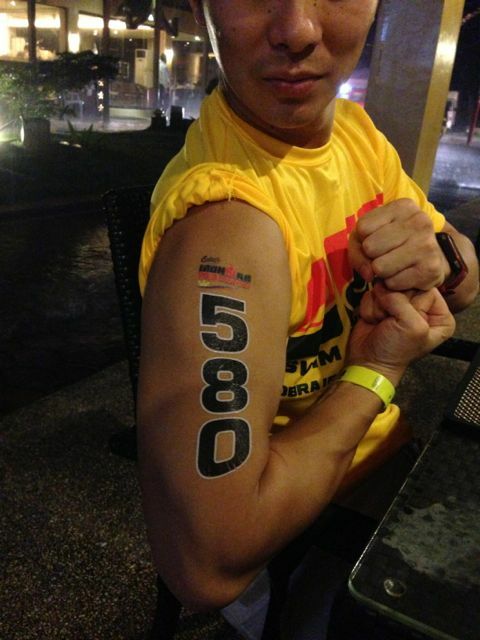 Even Race Numbers were temporary tatoos vs. the usual permanent marker! 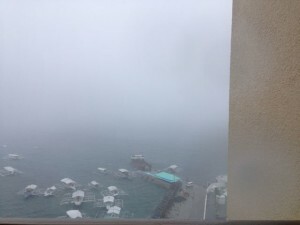 The forecast was for more rain – with strong cross winds and perhaps some sun by noon. Suddenly everyone’s concerns about heat stroke and overheating vanished and were replaced with the prospect of battling cross winds and slippery roads (not to mention sea swells on the swim). The good news however was that the race would go on and that currently cancelling any part of the race were not on the plans. 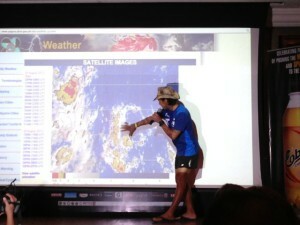 After the race briefing we were stranded at the hotel as torrential rain continued to batter the hotel. We managed to find some black bin bags to cover ourselves as we walked back to the hotel. That night we ate early at around 6PM and were all in bed by 9 thinking about what the weather would bring the next day. With alarms set for 4:30AM and all our gear laid out and bikes checked we were as ready as we could be for the big day. Next up – Cebu 70.3 Race Day Report! CONGRATULATIONS, ADRIAN, ON YOUR FINISH! It’s just a week away from my Ironman Cebu 70.3 and with the reduced triathlon training in the past month with the arrival of baby Aaron I’m more than a little nervous! But lots of encouragement from my Tribuddies friends and my coach (email below) have kept my hopes up and I felt great during today’s swim (1.6K) and run (15K) brick. The last few months have been quite a roller coaster. 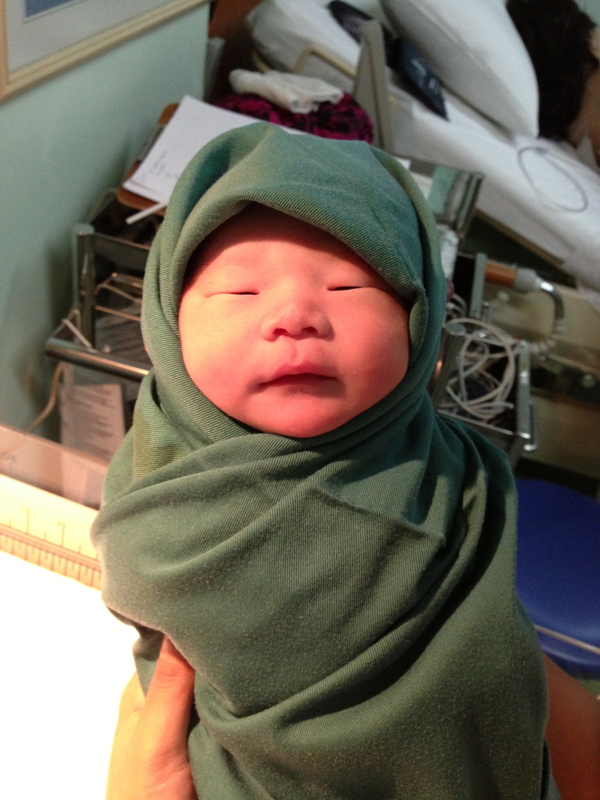 Our lovely baby Aaron Joseph Sai Yin Li was born on June 21st – just a week away from my own birthday and truly transformed our lives. After a long almost 12 hour labour my wife, Vanessa gave delivered our son in Jakarta at Medistra hospital. While overjoyed with the happiness of the healthy birth of our first child it has certainly been a challenge to fit everything in and now with just 2 weeks till my Cebu Ironman and a heavily reduced training load in the past 1 month it looks like my original goal of a 5Hour 30 minute time are now greatly diminished. 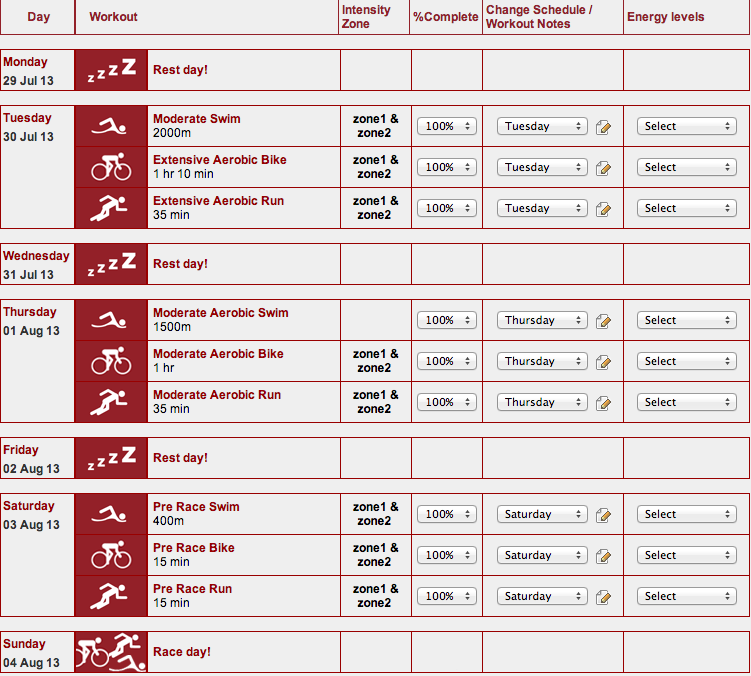 However, it will be an interesting test as to what my actual time will be given the reduced training. I am hoping that a sub 6Hr time is still achievable and if so that my full Ironman goal is still within reach as going forward Aaron has a more routine sleeping schedule and I can put in more regular training. Total Transition Time: 5 minutes – not a lot of time for cushioning but here’s hoping to a strong result! Today was a LSR (Long Slow Run) but a few whiskies the night before never helped a morning run (tho’ the morning run always helped get over the few whiskies the night before!). I’d rented Star Trek a good 2 hour movie to last the treadmill run so wondered down to the gym set the incline to 1% and pressed start! The movie definitely helped and the minutes went by – running at around 10KM/H by my foot pod and averaging around 160bpm. The run was a great confidence booster as it has been a while since running 20K and this one went by very painlessly!